All units are fully gasketed for tight, leak-proof installation, in compliance with the NEMA 12 Enclosure Ratings. UL Recognized models available as Listed at added cost. Heavy-gauge steel lifting eyes, attached to the side panels, assist in positioning units. Similar to the Airflow Switch shown in the Blower Accessories Section, the switch is installed in a suitable location in the air conditioner to detect loss of airflow, and sends a signal to a terminal block, through which user-installed wiring and warning devices are activated. 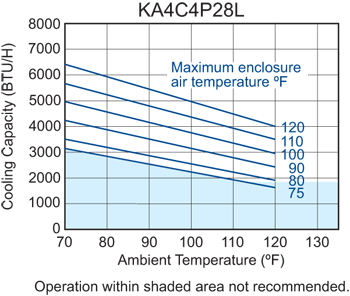 Maintains sufficient operating pressures when ambient temperatures drop below 50°F. Includes a compressor heater and a pressure device that senses the reduced discharge pressure and modulates the condenser blower. 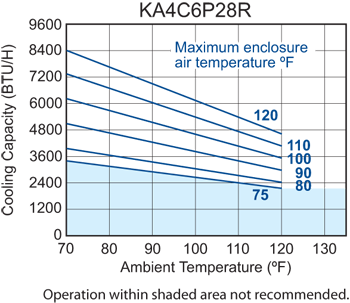 Effective to a minimum ambient temperature of 0°F. 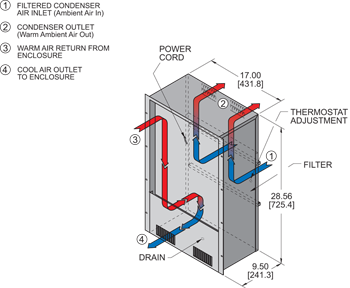 (Left-hand or Right-hand) Allows the air conditioner itself to be used as a cabinet door. (Caution: The cabinet must be able to support the full weight of the unit in open position.) Specify left-hand (LH) or right-hand (RH), determined by facing the mounting side of the heat exchanger. 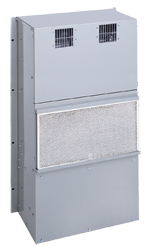 For outdoor installations subject to invasion by rain, snow or windblown dirt, special deflectors shield the condenser air inlet and outlet ports. Air conditioners or heat exchangers installed outdoors may also require special exterior paint. NOTE: Units using the Weather Protection Kit are not UL Listed. For P28 models the filter part number is 8751F.